Calypso Resort 2BR/2BA + Bunk Rm with Double Bed on 4th Floor! 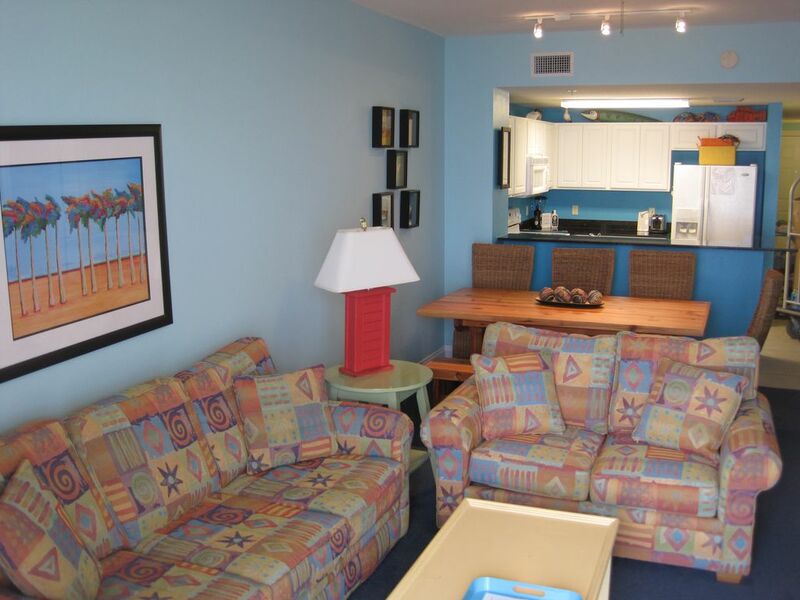 This condo located in the east tower on the 4th floor and is decorated in the Caribbean style, colorful and bright. A reserved underground parking place is available. There is an unobstructive view overlooking the sugar white sandy beaches and the emerald green water of the Gulf of Mexico. Standing on the balcony you will see the most magnificent sunrises and sunsets that you have ever seen. You may even see the dolphins playing in the Gulf. If you look to your right from the balcony you can see the world famous Dan Russell Fishing Pier (within Walking Distance) where you can catch anything from Spanish Mackerel, King Mackerel to Cobia, as well as many other species. Three Bedrooms and a Sofa Sleeper in the Living Room. Almost directly across from Calypso Resorts is the new multi-million dollar Pier Park project that hosts many Live Theaters, Live Entertainment, Shopping Mall, Restaurants and much more. The Super Target and Walmart stores are open for business. A huge covered parking garage is located right across the street with a walkway so you don't have to cross over the road waiting for traffic to slow down. Speedy elevators..You Betcha! Lots of elevators to make your stay all that more comfortable getting up and down to your Condo. NO SMOKING -- NO PARTIES -- NO PETS. The person responsible for the rental of the condo MUST BE 30 YEARS OR OLDER AND OCCUPY THE UNIT FOR THE ENTIRE RENTAL PERIOD with those under 30. I fell in love with my husband at the beach.-- I love the beach. The master has its own private bathroom while the second bathroom is accessed either from the second bedroom or from the main hallway. A reserved parking space under the tower is available as well as the general parking garage across the street. All bath towels, hand towels, and wash cloths are provided, but please bring your own beach towels. Charter fishing, boat tours, diving trips, sailing, and pontoon rentals are available near Treasure Island Marina. Cable TV in all rooms (4), phone (free local calls), utensils, cookware, dishes, stove, coffee maker, blender, mixer, iron, disposal, wall-to-wall carpet, balcony, bathrooms, and kitchen, full size washer and dryer, linens and towels, 2 pools. Please bring your own beach towels and hair dryer. We loved the unit. It was very clean! Had everything we needed for the week. We liked being on the 4th floor allowing us to avoid the elevator. The private parking spot was great! We would defiantly come back to this unit. Lisa was always able to respond quickly to my questions. Stayed her for a couple getaway during Pepsi Gulf Coast Jam. Room was perfect! The bed was so comfortable and loved waking up looking out at the ocean view right from the bed. There are so many restaurants within walking distance didn’t have to drive anywhere. Reserved parking was a big bonus and being able to take a short stair climb to 4th floor was very convenient ( if you didn’t want to take elevator). Thank you so much for opening your home to us. Counting down the days till we can make our next trip. Just got back from our stay 7/21-7/28. Loved our stay!! Room was just as advertised--although it did have a different color pattern in master bedroom--a nice improvement IMO. Nice to have the full bed in the third room. LOVED the underground parking space--VERY convenient--we were able to check in quickly due to carts being right there where you park! Beach chairs also included made this a very good value for the price. 4th floor was a very good spot for us, and one floor away from the parking garage access on the third floor, but as I stated it's even MORE convenient to utilize the reserved spot in the lower level. Would definitely recommend this room and would have no problem staying here again. This condo is nice & the location was great! Loved the views and being on the 4th floor. We enjoyed our stay, the condo was nice and spacious. The bunk room was great with the full bed and private door. Great location. Thanks for the review! I’m so glad you enjoyed your stay. We had put new flatscreens in the master bedroom and second bedroom as well as new furniture in the bedrooms with the king beds. I was wondering how you,our first guests in the unit after the upgrades, would like the unit. We look forward to having you back! We loved this condo! It was very clean with comfortable beds that felt like home. Loved the cookware that was provided...it was top of the line & had more than you'd ever need for any type of food you'd like to prepare. It was very close to the pier which was awesome! We enjoyed a parade from the back porch one day & fireworks from the front deck that night! My daughter said it was the best vacation she had ever been on! Thank you for a Fantastic Time! This condo was beautifully decorated and location was great on the fourth floor. It was wonderful having a private parking spot. Lisa was great to work with at booking! It was a very quiet relaxing vacation! Rates are subject to change and must be confirmed at time of booking. $300 damage/security deposit is due at the time of booking. Payment in full is due 30 days prior to arrival. For stays less than 5 days, departure maid service is not included in the rate and will be an extra $125.